First, my thoughts and prayers go out to all those affected by the recent tornadoes in the central US. Because of all the news about these tornadeos, the girls have had a lot of questions. I thought we would do an experiment to hopefully answer some of those questions. Thus, we did a tornado in a jar. 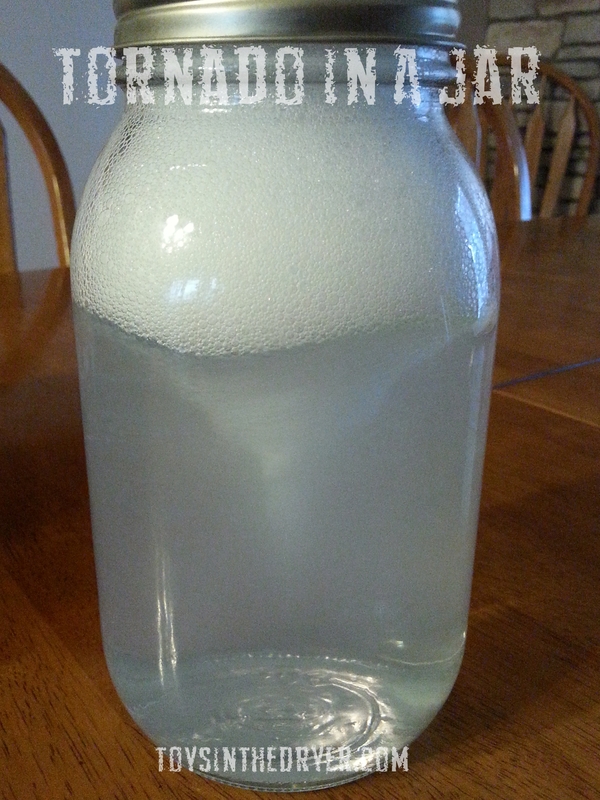 1) Fill the jar to almost full and add the dish soap. 2) Put the top on then shake it up to get some suds on the top. 3) Let the water settle out just a bit for the best results. 4) After the water has settled, shake the jar again in a circular motion. When you stop shaking, you should see a tornado form! 5) Let the water settle out again before making your next tornado. You can explain to your kids that tornadoes happen when two different air masses (usually a warm and a cold one) bump into each other. One mass moves faster than the other so they form a vortex just like the one in the jar. The water closest to the jar edge is moving faster then the water in the middle of the jar and that’s why the vortex forms. Feel free to add some glitter to your jar to simulate debris on the ground being picked up by the tornado. If you want to go even more crazy, add a marble and see how fast the water has to spin before the marble is picked up.